1) Women: Ask men for help. This doesn’t communicate to him that you’re weak, it simply communicates that you’re strong enough to set pride aside and ask. Many men desire to feel needed—and with the amazing accomplishments of women today, men don’t get as many chances to be affirmed in that area. Stated authentically, asking a man to accomplish a task for you can often be a gift…to him. (This doesn’t mean he wants to become your French maid while you eat bon-bons. Annnnnd depending on the task, it doesn’t mean he will jump for joy either.) The point is that every man wants the woman he loves (or is interested in) to BELIEVE that he CAN help you. It DOESN’T mean he thinks you CAN’T. 2) Women: How you ask matters. The guys I spoke with pointed out that “could” can subtly imply that I doubt if they can handle the task. Working for Love and Respect and studying men and women has made me acutely aware of just how sensitive men are to the women in their lives, especially in the area of competency. If she communicates that she doesn’t think he is able to do something—even in a joking manner—it can be like a swift kick in the pants to him. For me—as a highly competent woman, who has to handle most things on her own anyway— it took setting my pride aside to even ask for help or allow help. When I do though, I’ve seen something in many mens’ spirit ignite and I see something in my own spirit soften. Maybe that’s a bad analogy, or maybe I’ll end up marrying the yellow cab driver the next time I hit up the big apple. Until then, I think all of us can try to figure out what gifts we might be able to give to the person we like, love or are married to. Not because we can’t live without them, but because we want to let them live fully into the way God designed them. This is sooo awesome.Thank you for sharing these very important truths about choosing our words wisely, and being willing to let men help us women. I don’t always do a good job of letting men help me (or anyone for that matter), because I don’t want to be a bother. This was a helpful reminder that it’s totally ok to ask for help, and also to be careful with how I ask for it. You’re welcome! It was a good reminder for me too. Thanks for your words Ash. As a child I was taught the difference between “can I” and “may I”. This is very similar. When I see someone in need, I ask them if they would like help, inferring that they are capable but I would like to assist with their permission. Inflections and inference of words affect the manner in which we receive them. I have witnessed many arguments start due to a poorly worded question or phrase. Inflections are SO huge. That’s why half of what I text is misinterpreted…. Guess I need to use emoji’s more! I just had a light bulb moment. I work for a non-profit with a food bank. We get weekly trucks of food, and being the independent woman that I am, I tend to try and move/lift boxes no matter how heavy. Recently, one of the guys I work with made the comment, “Yeah, you’re independent” when I moved a heavy box instead of letting him move the box. When he said it, I knew his tone did not imply that it was a good thing, but I wasn’t really sure what he meant by it. After reading this post, I think he was offended by my not letting him get the box, when it was obviously hard for me. But I was only thinking that I didn’t want to just leave it for him, when I could do it myself. I’m definitely going to try to be more mindful of how my crazy “independence” comes across to the guys I have in my life. Great post. Speaking as a man, I whole-heartedly identify with what this said about men. We love when you ask us to open that tight jar of pickles, help fix a leeky faucet, or explain something that maybe we know a bit more about. We love to feel useful and be, in a small way, a bit heroic to the women we care about. Thank you for letting us do what we were called to do! Thanks for affirming Jeremy! And not all men can fix leaky faucet, but I think (and wouldn’t you agree) they just like being asked. The fixing isn’t the issue, the belief that they can is! this is one of my favorite posts you’ve written. ever. i still remember the ‘could’ lesson, i believe i learned from your father about 8 years ago and it’s such a strong, but subtle change. and i think the other big thing i’ve learned through 9 fun and rocky years of marriage is that HOW you ask or talk to your man is probably 90% of the message they recieve. i’m still working on that one. thanks for your great work here, joy! I loved this, Joy. It also brought to mind a song by a CCM artist, Rick Elias, that I think you’ll like. It communicates a man’s need to be believed in beautifully and powerfully. Well I think so anyway. Here’s a grooveshark link to it: http://grooveshark.com/s/If+You+Believed/2QoVJU?src=5. And I’ll definitely be be sharing this post with the Future Marriage University (FMU) community at https://www.facebook.com/FMUniversity. These are the kind of “Tidbits” I crave and search for! Thanks so much for honoring the Lord with your efforts at keeping up this website Joy. I am an old guy who, late in life developed a heart to help men in their relationships with Christ and with the women in their lives’. I too recall (after attending a conference by your parents) saying out loud “why did someone not tell me this earlier in life?” It went from saying to taking action. I now put together men’s groups to study God’s word, but also to help enhance men’s understanding of their own relationships. Very rewarding! Especially when one of these Tidbits can be used in a real life timely manner. The Tidbits which caused a light bulb to go on in my head prove to be instantly valuable, as each time I share them, I can actually see the light bulb going on in the head/hearts of those with whom I share. So the proof is in the pudding! Keep em coming, Joy! As a representative of the men, I agree with what you say in this Tidbit…especially with the part where you say how important the delivery attitude is…this can be huge. When it comes to men…we really do want to fix things. I was introduced to this way of thinking long ago by my husband (of 27 yrs). It didn’t take long for him to inform me that “can you …” equaled “i doubt your ability.” At least in his mind! It took some effort on my part, but i soon adopted his language when talking to him and other males (regardless of age). Made a world of difference! Btw, I have some fun unicorn pictures I’d love to send you! What’s the best way to do that? I’m not on Twitter or Instagram. It’s really cool that I stumbled upon this today. God has been speaking to me about this recently in kinda a different format, but this ties it all up. I’ve been really challenged that the worldviews of both Paternalism and Feminism are wrong… the de-valuing of the strengths of one gender to raise up the other gender which creates some sort of power struggle in which you find yourself trying to “prove yourself” to be strong and capable is completely wrong. 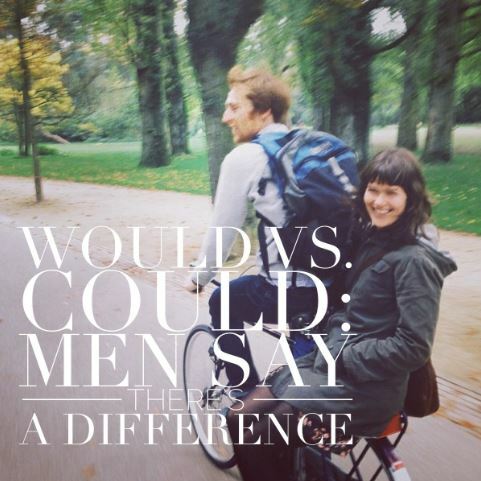 God made men and women different but equals. And I looked and saw that I was too often tearing down the guys (mostly in jest) or laughing at their attempts at life to make myself feel better/stronger, or brushing off their attempts to help me or protect me because I didn’t want them to think I was weak. But when I stop doing that and just accept that they want to help and this doesn’t make me any weaker as a person that I am happier and more content and that my friendships with them also improve. I’m not always on my guard either. So finding and putting into practice God’s viewpoint on woman and men being not in competition but equals has changed things so much even just in one week. I learned this year’s ago, early in our marriage (29+ yrs). Fortunately, my husband was able/willing to articulate that he felt insulted and that I questioned his ability when I used “could you” rather than “would you”? I thought I was approaching the ask in a gentler, less demanding way and he found it emasculating. Seeing that it was such a big thing to him, I made a conscious effort to change my wording. Simple change in syntax has made all the difference.